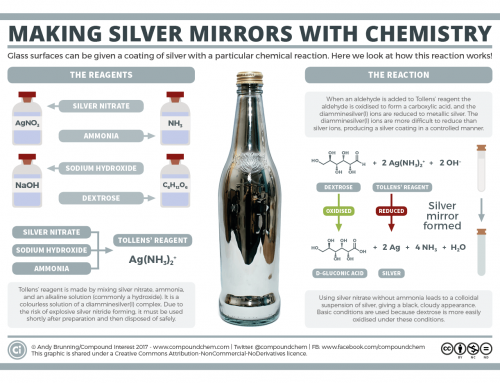 Here’s the start of a new series of collaborations with MEL Science, looking at a number of fun chemistry experiments and the explanations behind them. 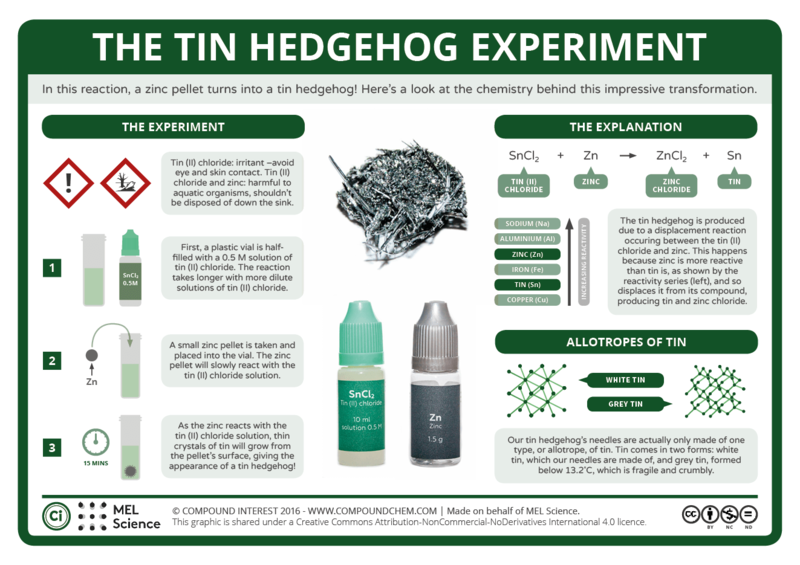 Today’s initial offering looks at how zinc pellets can be transformed into tin hedgehogs with some simple chemistry. Click through to the MEL Science site to see the experiment and read more about how you can get hold of an experiment set to try it for yourself; alternatively, read on below for some extra information and links to further relevant graphics! 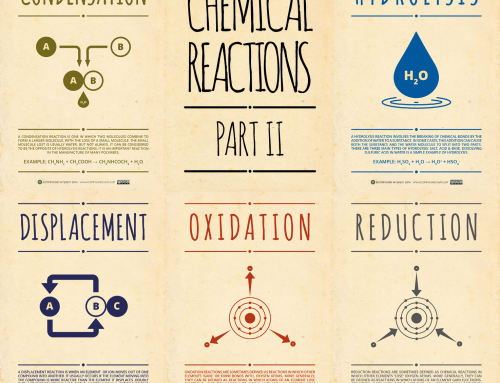 This experiment takes advantage of a simple chemistry concept: metal displacement reactions. Metals vary in their reactivity; some, like potassium, are highly reactive in their elemental form, and burst into flames on contact with water, whereas others, such as gold, are reluctant to react with anything at all. It’s a concept we’ve already explored in a previous graphic on the site, and it’s also the reason behind the zinc pellet’s transformation into a prickly ball of tin. 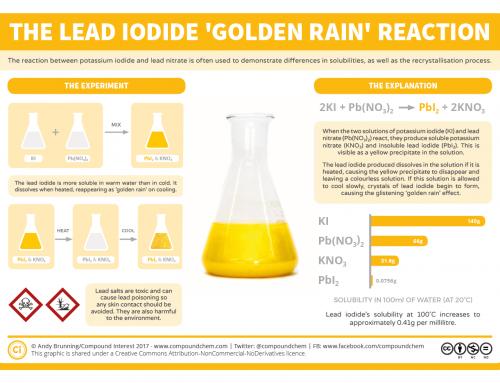 As zinc is above tin in the metal reactivity series, it’s able to displace the tin from the tin chloride solution that it is placed into. This forms zinc chloride solution, whilst the tin metal is deposited onto the surface of the zinc pellet. The tin crystals that form are quite fragile – though they maintain their structure when they remain submerged in the solution, they quickly collapse when they are removed, so unfortunately it’s not possible to maintain the ‘hedgehog’ in pristine form, as the picture in the graphic evidences! It’s in fact only one type, or allotrope, of tin that’s produced here: white tin. Other elements have allotropes too, with perhaps the most common example being carbon, whose allotropes include diamond and graphite. Tin has two allotropes, the aforementioned white tin and grey tin. White tin has a shiny, silver appearance, whereas grey tin has a duller appearance, as well as a weaker and more crumbly structure. This stark difference in properties is due to the manner in which the tin atoms are arranged in the two different allotropes. White tin, which is stable at and above room temperature, has all of the characteristic properties we expect of a metal: it conducts electricity, and has a silvery appearance. Grey tin, on the other hand, has a different arrangement of atoms that means it is left with none of its atoms’ electrons being able to move freely. This robs grey tin, which is stable below 13.2˚C, of its metallic properties. The slow transformation of white tin to grey tin at low temperatures (often referred to as ‘tin pest’ or ‘tin disease’) crops up in history more than once. Napoleon’s failed invasion of Russia is linked by some to the slow failure of the tin buttons on his soldiers uniforms as they slowly changed from white to grey tin. However, this has been disputed, as it’s unlikely that pure tin was used for the buttons, and alloyed tin is more resilient in the face of low temperatures. Though some soldiers may still have been affected, it’s unlikely that it was a major contributing factor. Robert Scott’s failed expedition to the South Pole has also been partly blamed on tin disease. The expedition made stops at depots containing cached food and fuel, which was stored in cans soldered together using tin. There’s speculation that tin pest could have caused the cans to leak and lose the kerosene they contained, compounding the expedition’s problems by leaving them low on fuel. Again though, this is likely an exaggeration, and probably not a significant factor in the eventual failure of Scott’s expedition. When containers from the expedition were found in the 1950s there was no sign of tin pest. There’s more detail on how to get hold of the MEL Science experiment sets here. 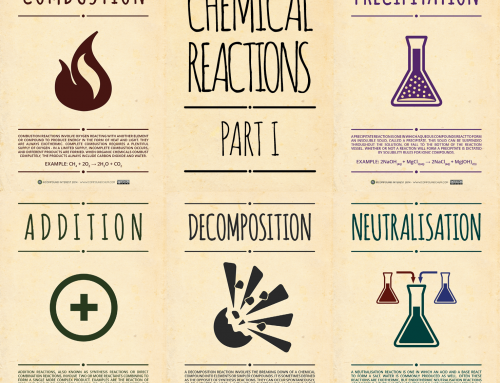 There’ll be more experiments and the chemistry behind them to follow here on the CI site in the near future!